The boxing fan deserve this fight as do Terence Crawford and Errol Spence Jr.. This is asking the improbable with these obstacles of duel promotions and televised streaming rights. However a fight of this magnitude to unify portions of the welterweight titles and determine the pound-for-pound best is bound to happen. Because it’s boxing, and the promotional fight has picked up a bit, they have to come to an agreement. Or do they? But for this to happen there also needs to be unity with the respective promoters and of course the personnel who would be involved with networks and rights to televise this potential mega fight. And with boxing, a fight like this can be done. Then again it becomes a waiting game of back-and-forth and someone giving in with a late punch in the final round. With Top Rank and the PBC, obviously the main principals to deliver this also falls into the lines of boxing politics. Boxing politics has never stopped Bob Arum and Top Rank from delivering. When the back-and-forth of politics concludes the fight is delivered. It has to be done and will be because Terence Crawford and Errol Spence Jr. is as huge as Mayweather and Pacquiao was. Perhaps this is bigger in magnitude because they are two champions, one with Top Rank and the other with the PBC, champions in the welterweight division. This elite division of welterweights that also generates the revenue and interest for boxing is shown in the ratings. 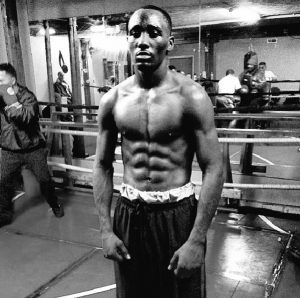 An this past Saturday, Terence Crawford, who could be the top pound-for-pound fighter in the business and Jose Benavidez Jr. established the highest rating boxing telecast on Broadcast and Cable television this year. So now, it is time to deliver a fight that boxing needs. A fight that the boxing fan will demand. Delivering this fight, according to sources, and that back-and forth talk has commenced. Moments after Crawford disposed Jose Benavidez Jr. in the final round Saturday night, his first defense of the WBO Welterweight title, Bob Arum was asked the questions. The fight boxing needs will have to wait but how long will it be? Arum does have the leverage here because Crawford delivers the numbers for ESPN and the Hall of Fame promoter has the platform. Spence Jr. also has the numbers with Showtime and the PBC has that history of also delivering the numbers for the network seen in previous fights Keith Thurman and Shawn Porter opposing Danny Garcia for the Welterweight title. In line with all of this, Tuesday Bob Arum made his pitch. Showtime, he said will soon be out of boxing just like HBO. “So I’m predicting also that within the next year Showtime will be exiting from boxing because as great as they’ve been for boxing, they don’t belong,” he said. This was possibly the beginning of a bargaining point of view because Showtime is committed to continue their involvement with boxing, and the PBC continues to thrive with all the rumors to the contrary. Arum is known to make some outrageous statements. This one, and only because he said Showtime is throwing more money into programming, does offer a line of truth. For the past few years it was HBO that lost the roster of fighters that put the network on top. But putting more of their budget into popular programs did boxing in for the network. This is the Haves and Have Not of boxing. However, with Terence Crawford and Errol Spence Jr. in the picture, it is about having the best fight for the boxing fan. Showtime and the PBC are moving along and so is Bob Arum and his deal with ESPN. Just a matter of time and the fight will happen. Arum, in the meantime will go back-and-forth but is looking at other opponents for his champion. Similar to Mayweather and Pacquiao and how long it took, at some point next year this fight will be a reality. And because this is boxing, it only works this way.